What could be more American than a rolltop desk? The rolltop desk was invented in the U.S. in the 1800’s as a better alternative to the difficult-to-make European cylinder desk, which was a writing desk with a rotating decorative cylinder that covered the work area. The tambour door of the rolltop desk was easier and more economical to make. As a result, the rolltop desk became the standard for desks in many U.S. offices from the late 1800’s to early 1900’s. 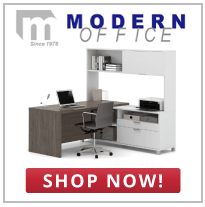 Modern Office now offers even more rolltop desks that are made in the USA. Now over 90% of the rolltop desks we carry are made right here in Minnesota. The new additions are not only American-made, but they are made of solid oak with modified dimensions to accommodate computers with large monitors and all-in-one printers. Even better, the new solid oak rolltop computer desks are in stock for immediate shipment. Call us at 1-800-443-5117 with any questions you may have.